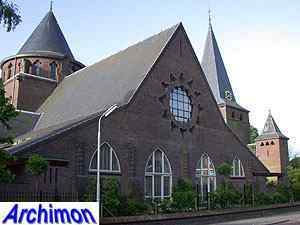 This church was to become the centre of a new neighbourhood and, not unusually, was built as one of the first buildings, together with the presbytery. H.W. 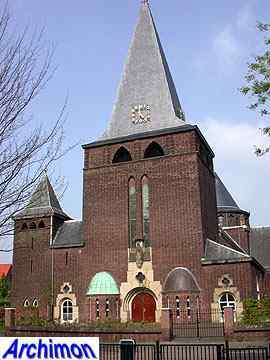 Valk designed church and presbytery in cooperation with local architect C.W. van den Beld, although the contribution of the latter is unknown. Like many of Valk's churches, this one has a short but massive looking tower. 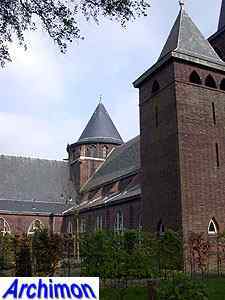 It's a three-aisled cruciform church with narrow side-aisles and a wide central aisle, an undeep but heightened choir and a very wide transept, all attributes of a christocentric church, providing an optimal view on the altar. The altar was illuminated by the windows of the dome above it. Valk built several such churches. 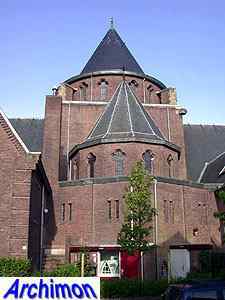 Overall, the church is built in an Expressionistic style, closely resembling that of the Amsterdam School, with parabola-shaped arches and inventive brickwork being used both outside and inside. Elements of Gothic and Romanesque architecture have also been used. At the front a few natural stone elements, like the entrance, remind of the work of architects like A.J. Kropholler and H.P. 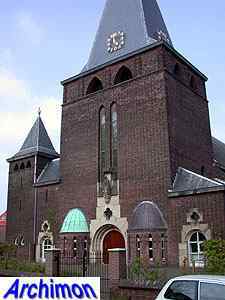 Berlage. 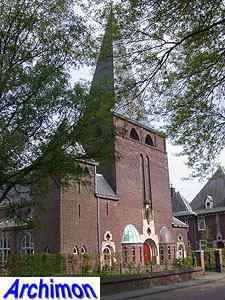 The church is similar in style and appearance to the one Valk built in Hilversum a year earlier. 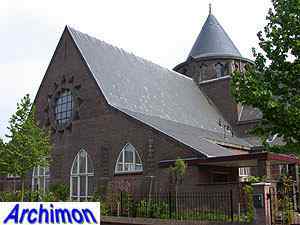 In the late 1990's the church was closed and rebuilt into six apartments later. The exterior of the former church was left mostly intact; only most of the windows were enlarged downwards while two doors at the front were replaced by new windows. Only the space under the dome has remained without a function since. 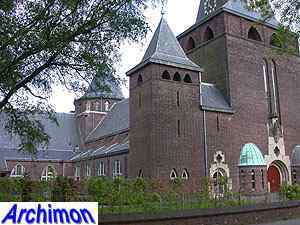 In 1998, before the renovation, parts of the ornaments of the interior were smashed to pieces by order of the 's-Hertogenbosch diocese, 'to prevent desegragation and vandalism'. The way this was done upset many people, and those responsible promised never to do something like this again. As a result, the demolition of another church was carried out in a much more respecting way.